While technology can play an important role in restructuring teaching and learning practices, teachers must take a leading role in designing appropriate learning environments that effectively incorporate technology to help their students learn well with technology. Computer technology, as tools, could empower students with thinking and learning skills, and help students interact with complex materials. However, computers alone cannot realize many educators’ vision for technology to improve education. Education is a lifelong process, therefore anytime, anywhere access to it is the need of our education system. Education should meet the needs of variety of learners and therefore I.T. becomes essential to fulfil this need. It is a requirement of the society that all the individuals should possess technological literacy. When we need to increase access and bring down the cost of education in order to meet the challenges of illiteracy and poverty. Hence I.T. is our answer. Multiple communication channels-e-mail, chat, forum, blogs, etc. Information Technology in Education, effects of the continuing developments in information technology (I.T.) on education. The pace of change brought about by new technologies has had a significant effect on the way people live, work, and play worldwide. New and emerging technologies challenge the traditional process of teaching and learning, and the way education is managed. I.T., while an important area of study in its own right, is having a major impact across all curriculum areas. 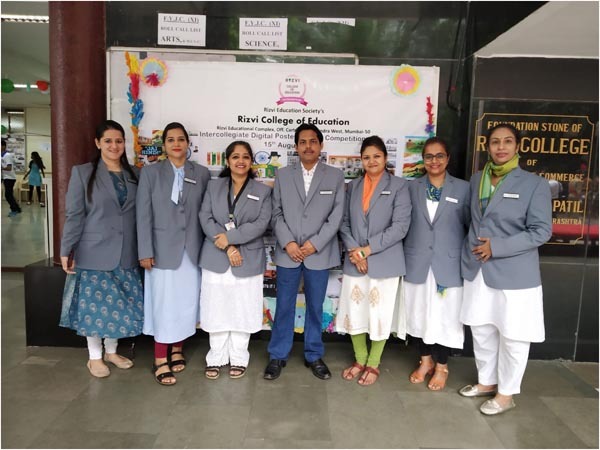 Rizvi College of Education is not just implementing ICT in its Teaching-Learning process, but is also motivating its Student- Teachers to follow its suit. 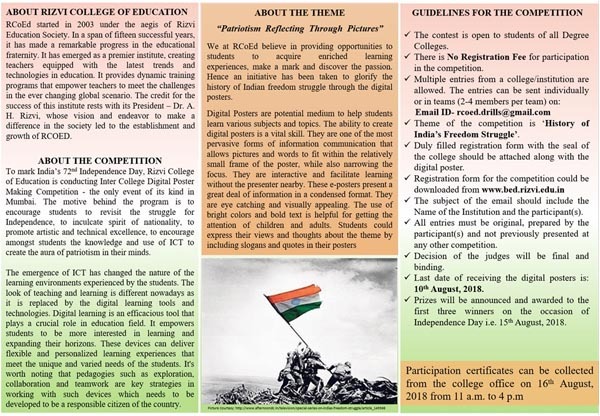 ICT Cell teachers along with the history club of RCoED organised an intercollegiate competition for digital poster making. 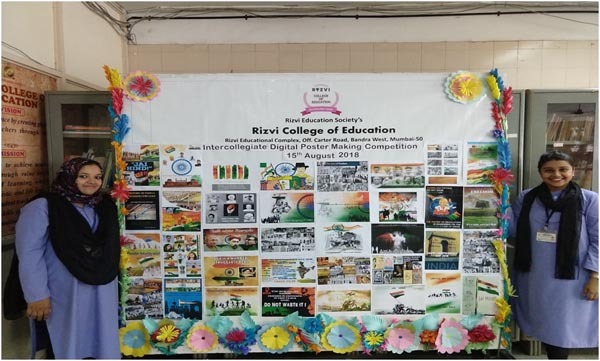 After a lot of screening and tough decision making, RCoEd was proud to announce the winners of Intercollegiate Digital Poster Making competition 2018. 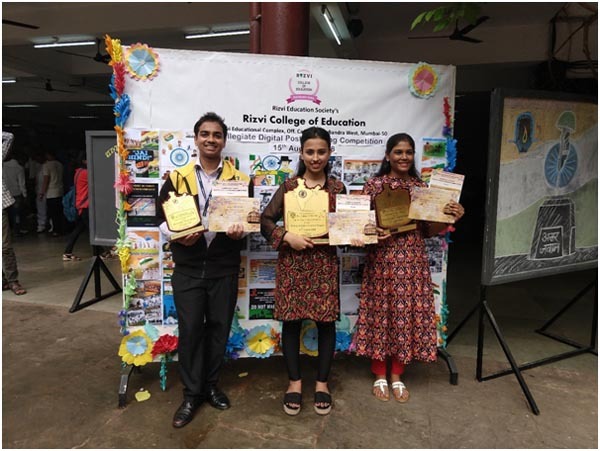 These winners are selected from over 100 entries received from the students across the colleges of Mumbai. Judges for the competition were IT experts and main criteria for selection was plagiarism. The prize distribution was held on 15th August, 2018 during the flag hoisting ceremony of the College. 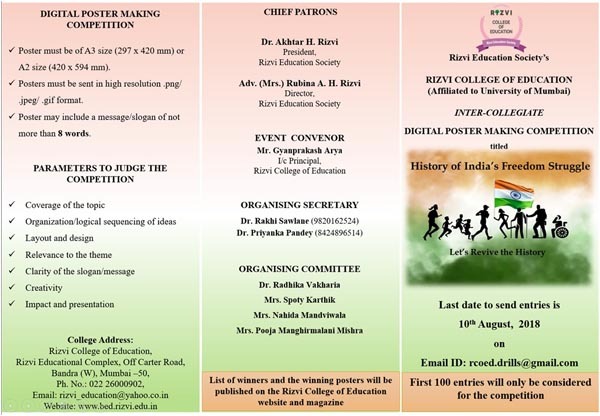 The winners were awarded with a trophy and corticates by the hands of our respected President, Dr. A.H. Rizvi and our respected Director madam, Adv. Mrs. Rubina A.H. Rizvi. 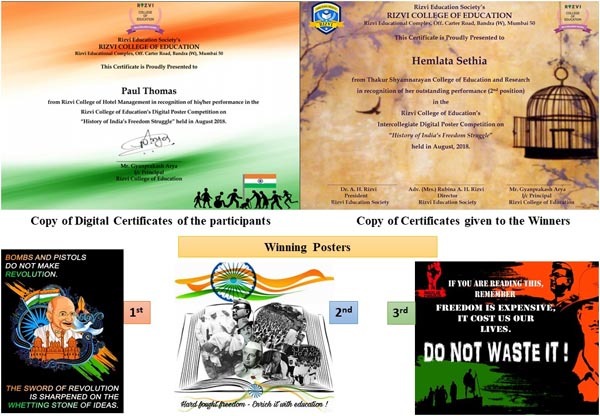 All the participants were given e-Certificates for their participation in the competition. The event was a great success. Below are a few glimpses of the felicitation ceremony.